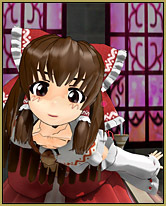 Reimu Hakurei [Version] V1.2a (Version 110509a). http://homepage3.nifty.com/knuko/mmd/mmdIndex.html … but a reader gave me THIS Link that includes NyaReimu … and a bunch of other fun things! The “ReadMe” specifically says “Do Not Redistribute” … so I cannot share my model with you. NyaReimu is the most complicated of my models. All of those flowing fabrics are properly weighted … LOTS of bones … the physics works very well. As you watch my video, watch carefully and see that at no time is there a failure … the skirt flows beautifully, the hands never pass through the sleeves, or anything like that. (OK … there IS one moment where her right sleeve flutters against her body “:o). I first made this animation as I wrote my previous article … a tutorial to help MMD newbies to make their first MMD music video. In that article, I used the model Mew that was supplied in the links that I referenced for that project. When I was done with that project, I played with the animation, a bit, and decided to upload THIS version to YouTube, just to show off the model. One of the tweaks I made was to adjust the video size from the original animation’s 512×385 “academy format” to a 16×9 widescreen 512×288. Although the widescreen was a good idea, my numbers are too small … and, at best, the video looks kind of low-res on YouTube! The “World is Mine” dance is high energy … but the frantic motions become much less-so when translated through the gentle swaying of NyaReimu’s beautifully-weighted heavy fabrics. … and my complicated model … and the MME SSAO_Lite effect … slowed my computer to a CRAWL when it came time to Render to AVI. In-fact, the first time I tried to render the video, my computer locked-up at about frame 580; the monitor went dark for a couple of seconds and, when my desktop was again visible, there was a large error message announcing that the ATI Video Card had suffered a temporary failure. I closed MMD … opened MMD, opened the dance, made sure the settings were correct and, again attempted to render to Video … and AGAIN had that failure occur … got that same message … at frame 620, this time. So … I shut off the computer.. I know that it was hot; had been running all day … 14 hours, at least?? … and I waited until next morning. 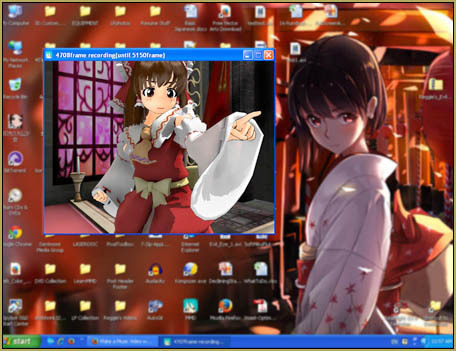 Then, I started the computer, opened MMD, and did a Render to AVI before the system had time to heat-up… SUCCESS! 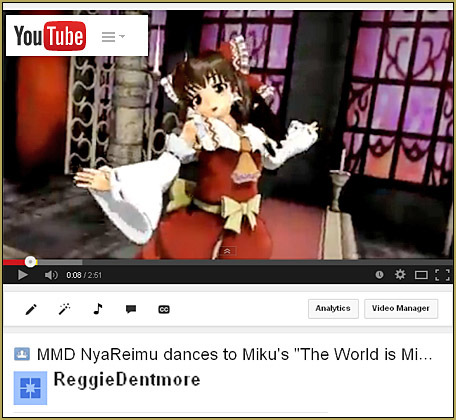 Enjoy watching NyaReimu dance to Miku’s “The World is Mine”. 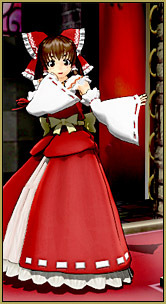 Yep, my favourite Reimu model of all, in fact I never liked ISAO’s and Nigamon’s Reimus, Nya’s looks much cuter! 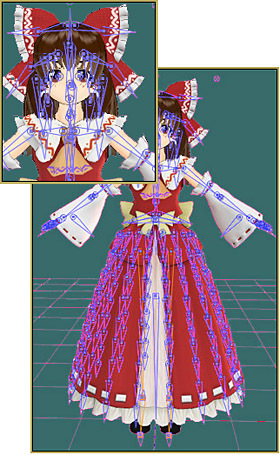 It also adds to cuteness that this model is made to recreate Sangetsusei (one of the official Touhou mangas) design and that older Nya’s models are a bit low on facials, but that one has a lot to work with. We don’t like to link to the actual zip … is there a page showing that link to the zip? – Thanks!